Swift doors are designed with safety and security as standard. Leading edges of the door are fitted with full height pressure sensitive edges, so if a door meets any resistance during closing, it immediately stops and reverses. In addition, photocell beams inside and outside, create a safe area around the door which greatly reduces the risk of an impact ever occurring. In the event of power failure, each door can be instantly and effortlessly opened by hand in around 2 seconds. Manufactured as a single piece construction, Swift door panels are fully insulated with CFC-free foam materials to optimise thermal efficiency and reduce noise pollution by 25dB. 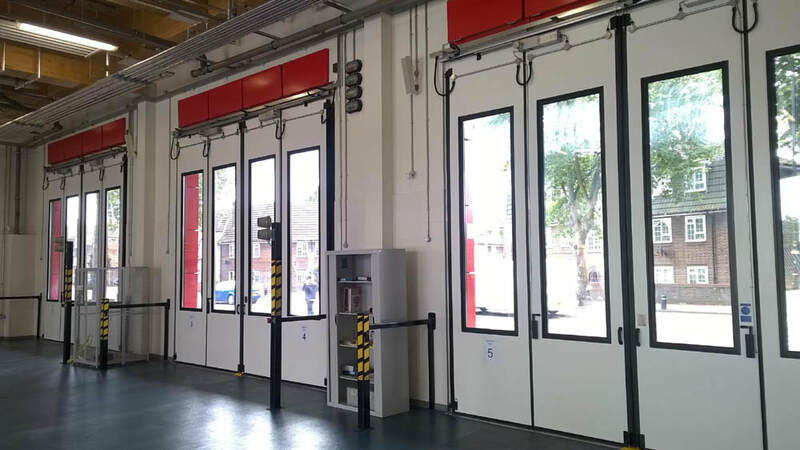 Options for partial or fully glazed doors are available. The new fire stations at Mitcham, Old Kent Road, Plaistow, Orpington and Dagenham are now in full service and the remaining four stations at Leytonstone, Shadwell, Purley and Dockhead are due for completion in early 2016.